Belmont Village Senior Living has earned a place on FORTUNE’S 50 Best Workplaces for Aging Services list. 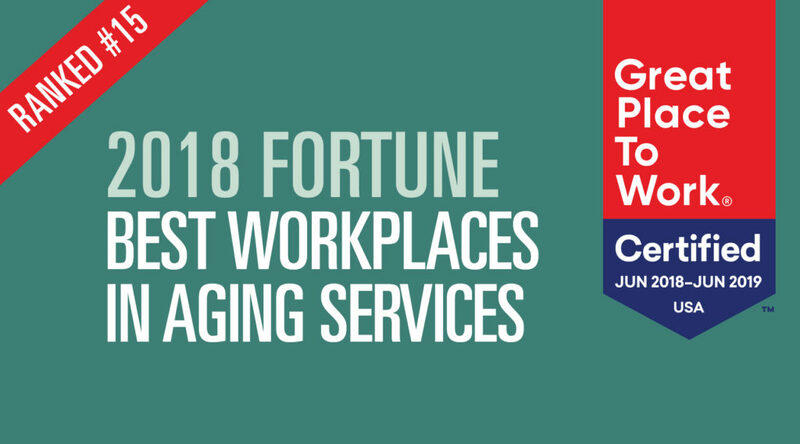 The ranking was achieved after the consideration of more than 162,000 employee surveys from companies in the Aging Services industry, which includes senior housing and at home care. The surveys, conducted by global people analytics and consulting firm Great Place to Work®, evaluated more than 50 elements of team members’ experience on the job, including employee pride in the organization’s community impact, belief that their work makes a difference, and feeling their work has special meaning. Belmont Village Senior Living is ranked 15th out of the top 50 senior care providers nationwide. Rankings are based on employees’ feedback and reward companies who do the best job of including all employees, from every role within the company, to provide a full range of perspectives. Belmont Village offers a range of programs and training tracks to help employees to develop within their positions and continue to grow their careers, along with multiple recognition programs to acknowledge, reward and celebrate employee achievements and successes. Founded in 1997, Belmont Village is an integrated developer, owner and operator of high end seniors housing with more than 3800 employees. Its communities are renowned for distinctive design, high standards of life safety, reputation for quality of care and award-winning programs. Since its inception, the company has developed and operates 28 senior living communities in seven states and Mexico City.